Menstrual pain is very common amongst young women. Despite the significant impact that menstrual pain has on academic attendance and performance, social activities and quality of life, most young women do not seek medical treatment but prefer to use self-care; commonly OTC analgesic medications and rest. Many women do not get significant pain relief from these methods, therefore other low cost, easy to learn self-care methods may be a valuable approach to management. This review and meta-analysis examines the evidence for participant lead self-care techniques. A search of Medline, PsychINFO, Google Scholar and CINAHL was carried out in September 2017. Twenty-three trials including 2302 women were eligible and included in the meta-analysis. Studies examined self-delivered acupressure, exercise and heat as interventions. Risk of bias was unclear for many domains. All interventions showed a reduction in menstrual pain symptoms; exercise (g = 2.16, 95% CI 0.97 to 3.35) showed the largest effect size, with heat (g = 0.73, 95% CI 0.06 to 1.40) and acupressure (g = 0.56, 95% CI 0.10 to 1.03) showing more moderate effect sizes. Exercise (g = 0.48, 95% CI 0.12 to 0.83) and heat (g = 0.48, 95% CI 0.10 to 0.87), were more effective than analgesics in reducing pain intensity, whereas acupressure was significantly less effective (g = − 0.76, 95% CI -1.37 to − 0.15). Exercise showed large effects, while acupressure and heat showed moderate effects in reducing menstrual pain compared to no treatment. Both exercise and heat are potential alternatives to analgesic medication. However, difficulties in controlling for non-specific effects, along with potential for bias, may influence study findings. Menstrual disorders are highly prevalent amongst women, and most commonly feature period pain and mood disturbances. Primary dysmenorrhea (period pain) affects around three quarters of all women during their reproductive life, and is especially common in young women in their teens and early adult life , with around 90% of Australian adolescents experiencing menstrual pain [2, 3]. Primary dysmenorrhea is defined as menstrual pain in the absence of any organic cause with the pain commonly starting within three years of menarche (the first menstrual period) . Primary dysmenorrhea’s characteristic symptom is crampy, colicky spasms of pain below the belly button, occurring within 8–72 h of menstruation, and peaking within the first few days as menstrual flow increases . In addition to painful cramps, many women with dysmenorrhea experience other menstrual related symptoms including back and thigh pain, headaches, diarrhoea, nausea and vomiting . The largest contributing physiological factor in primary dysmenorrhea is increased amounts of prostaglandins present in the menstrual fluid . Prostaglandins, especially PGF2a, stimulate myometrial contractions reducing uterine blood flow and causing uterine hypoxia. This hypoxia is responsible for the painful cramping that characterises primary dysmenorrhea [6, 7]. Primary dysmenorrhea is responsible for a decrease in quality of life [8–10], absenteeism from work or school , reduced participation in sport and social activities , altered pain perception and sleeping problems . Consensus guidelines  and reviews of the evidence [5, 6, 14–16] suggest that non-steroidal anti-inflammatory medications (NSAIDs) are an effective first line treatment for primary dysmenorrhea. The combined oral contraceptive (COC) pill is a common second line of treatment for primary dysmenorrhea [5, 7], though it may be used as a first line treatment when long-term contraception is required . While NSAIDs and COC are effective for many women, approximately 25% of women have pain that is refractory to either of these standard treatments [17, 18]. In addition, cultural differences also affect the usage of analgesics and the oral contraceptive pill, with Chinese women using significantly less NSAIDs or the oral contraceptive to control their menstrual pain than Australian women . Most women manage their symptoms with primarily over the counter (OTC) pain medications (e.g. ibuprofen and paracetamol/acetaminophen), and self-care including rest and the application of heat, rather than seeking medical advice [8, 9, 11, 20–27]. Lack of satisfactory pain relief and effective medical interventions in primary dysmenorrhea leads to an uptake of self-care strategies by women . Complementary, non-pharmacological or traditional medicine usage (such as herbal medicines or dietary changes) are often a significant component of self-care [28, 29]. Many women already use various forms of non-pharmacological techniques to manage their menstrual pain [24, 30, 31]. This is in addition to, or instead of, pharmaceutical pain relief due to either a lack of perceived effectiveness of these medications [23, 27, 28] or a dislike of using analgesic medication due to concern over side effects . However one key barrier in managing menstrual pain, whether it be pharmacological or non-pharmacological treatment, is that the intervention needs to be affordable, both in terms of time (in terms of attending appointments and scheduling) and cost . Non-pharmacological self-care techniques or lifestyle interventions, either physical or psychological, that can be practiced by women themselves such as exercise (including yoga and Pilates), heat, meditation, aromatherapy, self-massage or acupressure may fulfil these criteria, allowing women to potentially reduce their menstrual pain and need for analgesics, and improve their health-related quality of life. A recent Cochrane review examined dietary and herbal supplements (such as fish oil) for dysmenorrhea  but there are no recent reviews examining participant lead self-care interventions for primary dysmenorrhea. The aim of this review was to determine the effectiveness of participant lead self-care techniques and lifestyle interventions on menstrual pain intensity, duration, and analgesic usage in women with primary dysmenorrhea. Preferred Reporting Items for Systematic Reviews and Meta-Analyses (PRISMA) guidelines were adhered to throughout this review . 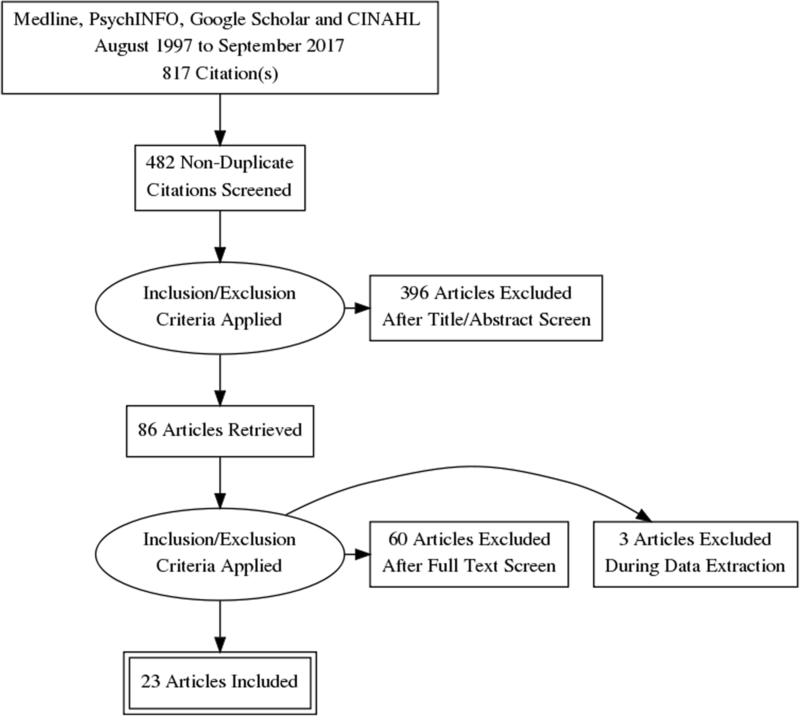 Databases searched included Medline, PsychINFO, Google Scholar and CINAHL from 1 August 1997 to 1 September 2017 using the keywords “self-care” OR “lifestyle” OR “breathing” OR “meditation” OR “exercise” OR “yoga” OR “acupressure” OR “massage” OR “aromatherapy” OR “mindfulness” AND “dysmenorrhea” OR “period pain” using the Boolean ‘AND/OR’ operators. These keywords are a modification of those used in our recent Cochrane review on pain management in labour . Both MESH and Non-MESH terms were included in this search. Papers that either had English full text or where an English translation was available from our recent Cochrane systematic review  were included. Reference lists of full text papers were searched, and any relevant articles identified were screened. For the purposes of this review, eligible interventions comprised of participant lead self-care and lifestyle interventions defined as physical, including exercise, or psychological techniques that women could administer themselves and were considered to be low-risk. The American College of Sports Medicine (ACSM) definition for exercise was used, where “exercise is physical activity characterized by using planned and structured repetitive movements to increase or maintain physical fitness” . Techniques such as yoga, meditation, mindfulness or acupressure, which could be learned (either in person or online) and independently self-administered were included, as was self-massage, but not massage that was delivered solely by a therapist or researcher. Acupressure was eligible when it was delivered by the participant for at least some of the trial period (e.g. was delivered and taught by a therapist for the first month), but not if only delivered by a therapist, researcher or other external party. Primary dysmenorrhea is a diagnosis of exclusion, and there is no conclusive test to diagnose primary dysmenorrhea. We did not include any trials that specifically included women with diagnosed secondary dysmenorrhea (such as PCOS or endometriosis). Randomised and quasi-randomised trials were included but cross-over trials, due to the cyclical nature of primary dysmenorrhea and the unknown wash-out period of most non-pharmacological interventions, were not included. For inclusion outcome measures needed to include either a direct measure of pain intensity or severity (such as a visual analogue scale (VAS) or numeric rating scale (NRS)), or a composite score using a scale such as the Moos Menstrual Distress Questionnaire (MMDQ) or the Short form McGill Pain Questionnaire (SF-MPQ). At least one of the comparator groups had to be a sham/placebo treatment, analgesic medication, oral contraceptive pill or usual care/no treatment. Two authors extracted the data independently and a third author (MA) resolved any disagreement. Where data was missing or unclear, the study authors were contacted via email by the authors to request the missing data be provided. Authors were contacted twice over a 6-week period. If no response was had in that time, the data was marked as missing. When multiple data points were available post intervention (e.g. end of intervention or one month follow up), end of intervention data was used as the primary time point. If follow-up data was available it was categorised into short term (1 to 3 months), medium term (3–6 months) and long term (6 months or more). Where there were multiple active intervention groups data was combined from self-care treatment arms into one group as per Cochrane guidelines . When multiple scales were used for pain intensity, preference was given to VAS or NRS over composite scores such as MMDQ that included non-pain related components, and therefore the composite score was not included in the meta-analysis if VAS or NRS scales were available. A narrative description of study characteristics (including intervention and control group descriptions, study location) was synthesised. Included studies were also assessed using the Cochrane Collaboration’s Risk of Bias tool . This examined study quality in six areas of trial design (sequence generation, allocation sequence concealment, blinding of participants and personnel, blinding of outcome assessment, incomplete outcome data, selective outcome reporting), ranking each area as high, low or unknown for risk of bias. Risk of bias assessment was undertaken by two reviewers independently (MA, CS, KS, FM). Any disagreements were resolved by discussion. Random-effects meta-analyses were conducted using Comprehensive Meta-Analysis software (Version 2). Intervention effect sizes were pre-post changes between intervention and control groups for the primary outcome measure (menstrual pain intensity/severity) and were calculated using Hedges’ g statistic , along with 95% confidence intervals (CIs) around the estimated effect-size. If pre-intervention scores were not available post treatment changes only between intervention and control groups were used. Pooled effect sizes were calculated using either menstrual pain intensity or composite pain scores (such as MMDQ) for each intervention type with > 2 studies, using random effects models. No study reported a pre and post-test correlation, therefore we assumed a conservative correlation of 0.7 for the primary outcome. Effect sizes were categorized as small (0.2–0.4), medium (0.4–0.8), or large (greater than 0.8) as per Cohen (1988) . Statistical heterogeneity between studies was quantified using Cochran’s Q and I2 statistic, both of which provide estimates of the degree of heterogeneity resulting from between-study variance, rather than by chance. Cochrane’s Q with p-value of < 0.05 was classified as significant heterogeneity, and I2 of more than 75% was considered to indicate high level heterogeneity, I2 of 50–75% as indicative of substantial heterogeneity, and an I2 of less than 40% as low heterogeneity. Publication bias was tested using the Begg and Mazumdar test, with a p-value < 0.05 suggesting the presence of bias [42, 43]. Where significant bias was detected, a Duval and Tweedie trim-and-fill analysis  was conducted to re-calculate the pooled effect size after removing any studies which may introduce publication bias (i.e., small studies with large effect sizes from the positive side of the funnel plot). Additionally, a “fail-safe N” was used to account for the file draw problem  estimating the number of non-significant unpublished trials which would be needed to cause the observed p value to exceed 0.05. Pre-planned subgroup analyses were conducted to examine whether effects of these interventions differed when comparing them to different control conditions; sham/placebo, analgesics, oral contraceptive pill and usual care/no treatment. Twenty-three trials including 2302 women were eligible and included in the meta-analysis. Figure 1 outlines the search and selection process. Table 1 outlines the characteristics of these studies. No eligible studies on mindfulness or aromatherapy were found. Heat patch (180cm2, 38.9 °C) for 12 h each day, plus placebo pills. 2. Control group – no medication but could use single dose of oral analgesic if pain was unbearable. Quasi-randomised based on presentation order. The group receiving the heat patch reported the greatest pain reduction at 4 h and at 8 h after the start of the intervention. SF-MPQ at 24 h after starting treatment. Sham acupressure: Same as active group but using ‘off channel’ points. Pain intensity (VAS) at 180 min following treatment. Article translated from Farsi. Acupressure group had significantly lower pain scores at 180 min post treatment than sham. Acupressure at CV4 and CV2. Pressure was applied for 15 s and then 15 s of rest for a total of 20 min. 1. Self-care behaviours. Four 60–90 min sessions, once per week. Isometric exercises were also taught. 2. Ibuprofen group: 400 mg, three times per day. Acupressure applied over the first two days of menses for two cycles. Comparator groups: Unclear about timing in relation to menses. McGill pain questionnaire (MPQ) at the end of the 2 month intervention. Both training and acupressure groups had greater reductions in pain than the ibuprofen group, however no between group comparisons were performed. Acupressure at LR3. Two minutes of firm pressure then two minutes of ‘massage’ on the point. Twenty minutes in total per session. Unclear if alternating sides were used. Sham Acupressure. Point located at the same level as LR3 but between the 3rd and 4th toes. Starting three to seven days before menses, for two menstrual cycles. Andersch and Milsom Scale (0 = no inhibition by pain 3 = work clearly inhibited by pain) during the first menstrual cycle post intervention. Acupressure at SP6. Four seconds of pressure and two seconds without pressure, for five minutes. After five minutes the alternate leg was used, for a total of 20 min per day (4 × 5 min cycles). Starting from onset of menstrual pain for two menstrual cycles. Menstrual symptom severity had a greater reduction in the acupressure group compared to the ibuprofen group. Acupressure at SP6. Alternate legs used, two five minute cycles of pressure on each leg (20 min total). Rest: Participants rested in the school health centre for 20 min. No significant difference in pain intensity scores between groups. Acupressure at LI4 + SP6. Six seconds of pressure, then two seconds without pressure for five minutes per cycle. Two cycles per acupressure point for four cycles (20 min) in total. Same as active intervention but on LI4 point only. 3. Rest: Participants rested in the school health centre for 20 min. Every day, for the first three days of menses for six menstrual cycles. Pain intensity (VAS) at the end of the six month follow up period. Active group (LI4 + SP6) vs rest was included in the meta-analysis. LI4 + SP6 group had the greatest reduction in pain intensity and menstrual distress compared to all three comparator groups. Acupressure at SP6, BL32 and LR3. Four seconds of pressure, then two seconds without pressure, repeated 10 times per minute. After five minutes the alternate side of the body was used for another five minutes. Two five-minute cycles per point, for 30 min in total. Education on the use of supplements and dietary therapy for dysmenorrhea. Three times per week for twelve months. Pain intensity (VAS) at the end of the 12 month follow up period. The acupressure group had greater reductions in pain intensity and menstrual distress compared to the education only group. Acupressure at SP6 for 30 min, once per cycle. Sham acupressure: Same as active group but using an ‘off channel’ points. Acupressure at SP6. Eight seconds of pressure and two seconds for rest for twenty minutes in total. Sham acupressure at SP6 (“light touch”), where no pressure was applied to SP6. Once during menses, timing unclear. Pain intensity (VAS), at end of intervention, 1,2 and 3 h post intervention. Acupressure caused a much greater reduction in pain scores from baseline than sham acupressure. Acupressure at SP6, LR3, LI4, SP16, ST36. Pressure for two minutes for each point. Total number of minutes unclear. (exact locations not given). Pressure for two minutes for each point. 2. Ibuprofen (400 mg) three times per day for three days. Starting 24 h before onset of menses for one cycle. Pain measured on both VAS and Andersch and Milsom Scale decreased in all groups after intervention, however ibuprofen and acupressure had the greatest reduction. Auricular acupressure at Liver (CO12), Kidney (CO10) and Endocrine (CO18) points using acupressure seeds under adhesive patch. Points were stimulated 15 times, three times per day. Sham adhesive patch: Patches placed on same points as active group but no acupressure seed. Points were stimulated 15 times, three times per day in same manner as active group. Auricular acupressure group had lower MDQ scores at the end of intervention compared to sham. No treatment – participants were told to rest for 20 min upon waking and at bedtime. First three days of menses, for three menstrual cycles. The acupressure group had a significantly greater reduction from baseline in pain intensity, SF-MPQ and MMDQ scores at the end of the three month intervention. Auricular acupressure group had greater reductions in both pain and MDQ scores from baseline than sham. Ibuprofen (400 mg) at onset of pain and taken every eight hours if needed . From onset of menstrual pain, number of days per cycle unclear. Two menstrual cycles. Pain intensity (self-reported), scale unclear. Both acupressure and ibuprofen groups had reductions in pain from baseline and there was no between group differences. abdominal breathing about 10 times. the floor, then the other, repeat 20 times. Both severity and duration of pain decreased significantly from baseline in the stretching group. No change in the control group. Mefenamic acid (250 mg) every eight hours when in pain. Pain intensity and duration significantly decreased in both groups from baseline, with no differences between groups. Quasi-randomised based on location Pain severity and duration decreased significantly from baseline in the Yoga group, and this was significantly different to the no treatment group. Quasi-randomised based on location. Stretching exercise group pain intensity, duration and analgesic usage decreased significantly from baseline and this was significantly different to the no treatment group. 10 cycles of surya namaskara for 15 min and then performed shavasana for 5 min of relaxation. Next, five cycles of cat, cobra, and fish yoga poses were performed for 10 min. Finally, the participants performed yoga nidra for 30 min. Yoga nidra was performed in shavasana. This was done for 1 h once a week. Moos Menstrual Distress Questionnaire (MMDQ) at the end of the intervention. Menstrual pain intensity and distress decreased significantly in the yoga group compared to the no-treatment group. No participant reported adverse events. Four studies examined the effect of heat [46–49], 14 studies examined the effect of self-administered acupressure [50–63] and five studies the effect of low intensity exercise, either stretching or yoga postures [64–68]. Two of the acupressure studies [59, 60] used auricular acupressure, pressure on certain parts of the ear thought to correspond to different organ systems, while the remainder used points located on the body. The majority of the studies were performed in Iran, with five studies [54, 55, 59, 60, 62] performed in Taiwan, two studies [46, 47] performed in the USA, one  in Turkey, one  in Hong Kong and one  in Korea. Eighteen studies had two arms, three studies [48, 51, 58] had three arms while two studies [47, 54] had four arms. Control groups were clinically heterogeneous. A pharmaceutical analgesic control, such as ibuprofen, paracetamol or mefenamic acid, was used in nine studies [46–49, 51, 53, 58, 61, 65]. Sham acupressure was used in seven studies [50, 52, 56–60]. No treatment controls were used in six studies [48, 63, 64, 66–68], prescribed rest was used in two studies [54, 62], education on self-care was administered in two studies [51, 55] and placebo pills and unheated patches were used in one study . Pain intensity or severity as measured by the VAS was used as the primary outcome in the majority of trials. Composite measures such as The Andersch and Milsom scale  was used in three trials [52, 58, 66], the McGill Pain Questionnaire (SF-MPQ) in three trials [49, 51, 63] and the Moos Menstrual Distress Questionnaire (MMDQ) in five trials [54, 55, 59, 63, 70]. Categorical measures of pain relief using a Likert type scale were used in two trials [46, 47]. Pooled effect sizes used all the above measures of pain intensity and severity but not of duration. All studies measured pain relief either during or at the end of the intervention itself. Studies using heat based interventions measured pain relief or pain intensity only while the heat was being applied in three of the four studies, either over eight [46, 48] or 12 h , with one study measuring the outcome 24 h later . Three acupressure studies measured pain intensity scores at 180 min post intervention [50, 56, 57]. The majority of studies using acupressure and all exercise interventions measured pain intensity that represented the entire menstrual period. No studies assessed short, medium or long-term pain relief after the conclusion of the intervention. Adverse event reporting was limited in the included studies. Only three studies, two using heat [46, 47] and one using exercise  reported adverse events as part of their outcome measures. One study on acupressure  reported that adverse events were a reason for drop outs in the control group but no further details were provided. Overall most studies were assessed as having a high risk of bias for at least one domain, and all studies rated unclear for at least two domains, with no studies rating low risk of bias across all domains. Figure 2 shows the overall bias assessment across these domains. Figure 3 shows the risk of bias in each individual included study. Ten studies rated low risk of bias for random sequence generation, 12 studies rated unclear risk and one study was rated high risk of bias. Three studies were at low risk of bias for allocation concealment, with the remaining studies rating unclear. Twelve studies rated high risk of bias for performance bias (blinding of participants and practitioners), with seven studies rating unclear risk of bias and four studies having a low risk of performance bias. Fourteen studies rated unclear for risk of bias relating to detection bias (blinding of outcome measurement), seven studies had a high risk of detection bias, and two studies rated low risk. Twelve studies rated low risk of attrition bias (incomplete outcome data), five rated unclear risk and six were at high risk. Twenty-two studies were at unclear risk of bias for reporting bias, with one study being rated high risk. Ten studies were rated low risk of other bias, twelve had an unclear risk of bias, and one was high risk. The pooled effect of heat therapy (Fig. 4) showed a moderate reduction in menstrual pain (N = 4, n = 639 g = 0.73, 95% CI 0.06 to 1.40, I2 = 92.9,). When compared to analgesic medication control groups only (Fig. 5) there was a small to moderate reduction in pain intensity (N = 4, n = 639, g = 0.48, 95% CI 0.10 to 0.87, I2 = 76.5). The overall pooled effect of acupressure (Fig. 4) showed a moderate reduction in overall menstrual pain (N = 13, n = 1086, g = 0.56, 95% CI 0.10 to 1.03, I2 = 92.5,). Acupressure was moderately less effective than analgesic medication (Fig. 5) in reducing pain intensity (N = 3, n = 360, g = − 0.76, 95% CI -1.37 to − 0.15, I2 = 87.2,), but showed a large benefit compared to sham acupressure (Fig. 6) (N = 6, n = 526, g = 1.1 95% CI 0.42 to 1.17, I2 = 91.5) and a moderate benefit vs no treatment (N = 4 n = 215, g = 0.62 95% CI 0.003 to 1.24, I2 = 79.4) (Fig. 7). The overall pooled effect of exercise (Fig. 4) showed a large reduction in overall menstrual pain (N = 5, n = 575, g = 2.2, 95% CI 0.97 to 3.35, I2 = 96.7). Exercise was moderately more effective than analgesic medication in reducing pain intensity (N = 1, n = 122, g = 0.48, 95% CI 0.12 to 0.83) and showed a large reduction in pain when compared to no treatment (N = 4, n = 453, g = 2.6, 95% CI 1.41 to 3.78, 4 studies, I2 = 94.8) (Fig. 7). There was no evidence of publication bias in trials using heat (p = 0.15) or exercise (p = 0.23). There was evidence of publication bias in trials using acupressure (p = 0.0012). A trim and fill analysis did not result in the removal of any studies and therefore no changes to the effect size. The “fail safe N” for acupressure studies was 140, meaning 140 unpublished studies showing no difference between groups would be required before statistical significance would be > 0.05. Of the three studies reporting on adverse events, only one study on heat reported a single adverse event associated with treatment; a mild reddening of the skin due to heat application . Lifestyle interventions consisting of heat, low intensity exercise and acupressure, appear to provide significant positive reductions in pain intensity, duration and other bothersome symptoms related to menstrual pain. Low intensity exercise, consisting of yoga and stretching, showed the largest and most consistent positive benefit, with large reductions in pain compared to no treatment and a moderate reduction when compared to ibuprofen, a common over the counter medication used by women for period pain . While the included clinical trials do provide evidence of the effectiveness of yoga and stretching, conflicting results exist from population studies examining the relationship between exercise in general and period pain; with some studies showing no effect of exercise , some a positive effect  and some a negative effect  especially with regards to negative emotional symptoms such as anxiety that can accompany menstruation . Indeed, some women reduce exercise during menses itself [11, 23, 32] while some women prefer to exercise more . This discrepancy between the effectiveness of exercise in the included clinical trials and the community-based research is likely, at least in part, to be due to the definitions of exercise used in these community-based surveys and the weighting given to more aerobic or higher intensity exercise when calculating the amount of exercise performed. Exercise has often been conceptualised in the public perception as mostly high intensity aerobic activities such as running, swimming or cycling, or resistance training; however lower intensity types of exercise such as yoga, tai chi, Pilates and stretching are gaining greater attention as effective alternatives to the sometimes more injurious traditional forms of high intensity exercise . Interestingly Daley (2008), in a previous review of exercise for menstrual pain, suggested that despite evidence for the effectiveness of exercise broadly for reducing pain, little evidence exists that favours higher intensity (aerobic) exercise over lower intensity options such as yoga and stretching . Different intensities of exercise may operate via different mechanisms. Moderate to high intensity exercise may reduce pain via increasing anti-inflammatory cytokines  and by reducing the overall amount of menstrual flow , thereby decreasing the overall amount of prostaglandins released. Less intense exercise, such as yoga can reduce cortisol levels , which in turn can reduce prostaglandin synthesis . Yoga may have beneficial effects that encompass more than menstrual pain severity. Increased inflammatory markers (such as IL-6  and CRP ) are thought to be involved not only in pain but also in mood changes related to menstruation. Mood changes have been shown to be more distressing to many women than the pain itself . There is evidence to suggest yoga may reduce mood changes  and this may be mediated via reductions in these inflammatory markers . Heat therapy, using adhesive heat patches on the lower abdomen, showed a moderate improvement in pain intensity compared to placebo patches, placebo pills or no treatment and a small to moderate improvement compared to ibuprofen. Heat may work via both increasing blood flow in the abdominal area  and by the ‘gate control’ theory of pain inhibition, where topical heat activates thermoreceptors, inhibiting concurrent nociception and reducing pain signals reaching the brain . While these are promising findings there are several caveats that may reduce heats effectiveness. Most women in the community are unlikely to be able to maintain constant heat at 38 to 40 degrees for 8–12 h using heat packs or hot water bottles, the most common forms of heat used . Heat therapy may also be less effective in those women with greater amounts of adipose tissue on the abdomen, as this acts as a thermal insulator . Therefore, while heat may provide women in the community with reduced pain intensity, it is likely to be of a smaller magnitude than when applied under tightly controlled experimental conditions. Heat, in contrast to exercise, appears to be best reserved for use during menses itself, for rapid, short term pain reduction. Acupressure showed the most modest benefit in overall pain, with a moderate effect size below heat and unlike heat and exercise, did not show any superiority over analgesic medication. Acupressure is likely to work through a number of pathways, similar to acupuncture, including increasing endogenous opioid release, and increasing uterine blood flow . Our findings on the effect of acupressure are in agreement with other systematic reviews for dysmenorrhea  as well as for pain more broadly . While less effective than exercise, acupressure can be easily learnt and simply applied and therefore is a possible adjunct treatment, especially for situations where heat may not be accessible, such as travelling or at school, and for women who do not wish to engage in exercise. Self-care interventions that women can perform themselves, such as yoga, heat and acupressure are important tools in empowering women to become their own ‘disease manager’ . Women find self-care increases the sense of agency they have over their menstrual cycles, and menstrual pain in particular . Given that low impact physical activity, especially yoga postures, are an accessible lifestyle intervention that confers a number of benefits over the reproductive lifespan including improvements in perinatal depression and menopause , it should be recommended, especially in women who receive no or incomplete relief from analgesics. Heat, and to a lesser extent acupressure, may play a role in reducing pain during the menstrual period when performed either prior to, or during menses, and may help in the management of acute menstrual pain. There are a number of areas which need to be addressed in future research. Given the high prevalence of menstrual cramps, especially in women under 25, researchers have proposed a need to differentiate between normal menstrual cramping from that of dysmenorrhea based on the negative impact on normal activities and inability to manage with analgesics . None of the included trials have made this distinction. This would allow better real-world outcomes, as pain severity increases, so does uptake of self-care practices [92, 93]. Dysmenorrhea commonly results in either absenteeism or reduced classroom performance [2, 9] however trials did not report on these important outcomes. Similarly, given the relationship between increased menstrual flow and dysmenorrhea  this factor either needs to be controlled for, or included as an outcome measure in future studies. Additional factors that should be controlled for include; smoking status, BMI, oral contraceptive usage and nulliparity . Finally, given that secondary symptoms such as mood changes and fatigue are very commonly reported , and have significant negative impact on women  outcome measures should be developed and included that include quantification of these symptoms. This systematic review had a number of strengths; we searched for a wide variety of self-care interventions using a broad range of English language databases, had access to translated copies of papers with English language abstracts and undertook the meta-analysis using a ranked order of validated measures. However, there are several important limitations. Firstly, we did not search non-English language databases, therefore if there were publications in journals where there was not an English language abstract these may have been missed from our search, and any papers without an English translation were not able to be included. Secondly, despite grouping together similar interventions there was significant heterogeneity, which was not unexpected given the diversity of interventions and control groups seen in the included studies. This was statistically accounted for in the analysis by using a random effects model, but it does indicate significant differences in the delivery of interventions, and thus we were unable to identify any particular types of intervention (e.g. yoga vs stretching) that were superior. Thirdly, adverse event reporting was poor in most of the included studies. It was unclear if adverse events did not occur or if there was no monitoring of these as part of the study protocol. The included studies on heat suggest minimal risk. Previous systematic reviews have shown that yoga is a relatively safe intervention compared to usual care or exercise . Acupressure, without the use of a device to apply pressure, appears to be a very low risk intervention . Despite the perceived low risk of these interventions, future studies of exercise and acupressure need to include systematic adverse event reporting. Fourth, it was impractical to reduce the risk of performance bias from these interventions. There was an unclear or high risk of bias in the majority of the studies with respect to blinding (either detection bias or performance bias). Due to the self-reported nature of pain, a lack of blinding is likely to induce significant non-specific effects. To overcome these issues, future studies could compare different forms of exercise (e.g. high vs. low intensity, aerobic vs. resistance training, frequency and duration of sessions). This would control for intervention effects while also gaining new insights into types of exercise which may be most beneficial for menstrual pain management. Fifth, the search terms used had a strong focus on mindfulness and relaxation for psychological techniques, therefore papers that used other psychological techniques (such as cognitive behavioural therapy) are likely to have been overlooked.Finally, the risk of bias was unclear for many domains in most of the included studies. This does not necessarily imply low quality, however poor reporting means that caution around the magnitude of these effects would be prudent. Given the large proportion of women who get little to no relief from OTC analgesics, our meta-analysis suggests that heat, acupressure or exercise may provide an effective adjunct, or in the case of exercise and heat an effective alternative to, analgesic medication for the management of pain in primary dysmenorrhea. Current research does not address the significant non-specific effects associated with exercise or acupressure interventions. There is a need for future rigorous research designs. Future research on a package of care including some, or all, of these self-care interventions would provide a better understanding of the potential effectiveness and resource requirements of these interventions in a community setting. Dr. Joe Firth for his invaluable assistance with the meta-analysis and feedback on the manuscript, Mr. Justin Sinclair for his assistance with the flow of the manuscript and the translators from the Cochrane Gynaecology and Fertility group who translated the papers from Farsi or Chinese to be included in this study. Nitisha Kulkani and Hannah Olive, undergraduate health promotion students, who helped perform the original scoping search in early 2017. No external funding was provided. Western Sydney University provided funding for all authors as part of their normal academic roles. MA and CS conceptualised the review, MA performed the searches, MA, CS, KS and FM performed the data extraction and risk of bias assessment, MA performed the meta-analysis, MA wrote the first draft of the manuscript. CS, KS and FM provided critical feedback and edits to the draft. All authors approved the final manuscript. MA and CS: As a medical research institute, National Institute of Complementary Medicine (NICM) receives research grants and donations from foundations, universities, government agencies and industry. Sponsors and donors provide untied and tied funding for work to advance the vision and mission of the Institute. This systematic review was not specifically supported by donor or sponsor funding to NICM. Ghaderi F, Asghari Jafarabadi M, Mohseni Bandpei MA. Dysmenorrhea and self-care strategies in Iranian female students: a regression modeling of pain severity and underlying factors. Int J Adolesc Med Health. 2016;29(6). https://doi.org/10.1515/ijamh-2016-0017.